Neuhoff Media Springfield raised over $6,000 for the United Cerebral Palsy (UCP) Land of Lincoln. The UCP Telethon was held on January 26, 2019, and hosted by Sports Radio 1450’s Sam Madonia and WFMB-FM’s John Spalding & Heather Anderson. Staff from 99-7 The MIX and 104.5 WFMB volunteered their time to answer phones during the telethon and solicit donations from the community. 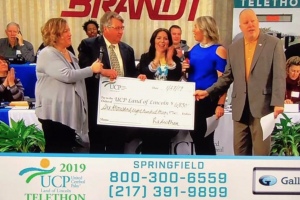 2019 marks the 35th, and final, year for the UCP Telethon. The final total was over $200,000 raised for programs that assist individuals affected by cerebral palsy in central Illinois.